For your convenience you have the option of purchasing your tickets online or at the door. Please visit the Comicpalooza website for more information and to purchase your tickets (it's cheaper if you buy online). Use coupon code "HoustonNerdsUnite" to get $5 off a 4 day pass or $3 off of a 1 day pass. Also follow Comicpalooza on Twitter @Comicpalooza to stay up to date on everything you need to know about this year's event. If you are interested in attending this year's Comicpalooza and you haven't purchased your tickets yet you are in luck, Butterfly LifeStyle blog will be giving away a Family 4 Pack of Tickets to this year's event! To enter this give away send me a tweet @BellePrincessTX or post on the BLS facebook fan page wall saying: "Those are my Comicpalooza tickets! #HoustonNerdsUnite" for a chance to win. It's that simple! Giveaway opens 5/7 and closes 5/18, winner will be selected at random and notified on or before May 20th. This was by far my favorite, I freaked when I saw this little dude last year. 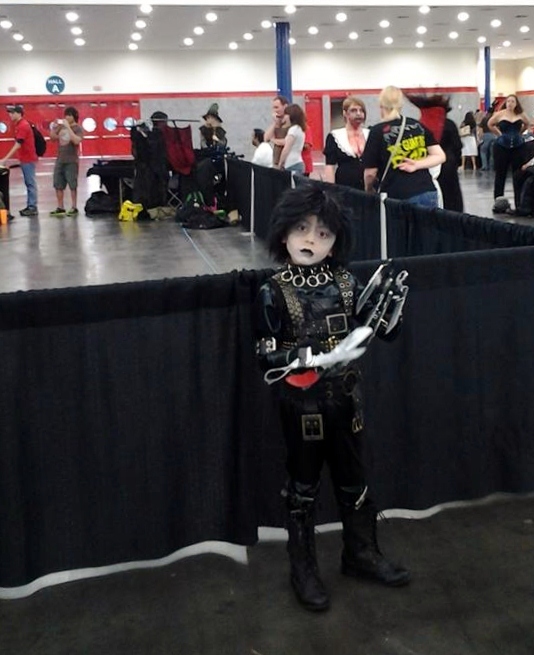 I freaking LOVE Edward Scissorhands! Lol, my hubby says I only like it because I'm in love with Johnny Depp. Well...I do LOVE me some Mr. Depp. Check out more of my photos from last year's Comicpalooza HERE! Disclosure: This is a sponsored post. All thoughts, opinions and expressions above are my own. The winner has been notified, thank you for participating in the give away!